Where the best cruise ships launch and the greatest getaways begin. Just outside Port Everglades, another getaway awaits, featuring dining, shopping, beaches and fun. Upgrade every cruise with a stay in Greater Fort Lauderdale. THERE’S A REASON IT’S CALLED THE CRUISE CAPITAL OF THE WORLD. IT IS. Modern cruising was invented at PortMiami. Today, we are the global headquarters for the world’s largest cruise lines and proud to be the home port of the world’s most exciting and modern cruise ships. For itineraries to the Bahamas, the Caribbean, Mexico, and beyond, PortMiami will always be the Cruise Capital of the World! For more information, please visit www.miamidade.gov/portofmiami. 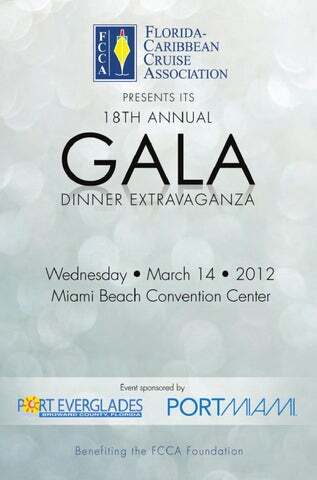 Welcome Message We are pleased and excited to welcome you to the 18th annual Gala Dinner Extravaganza. Hopefully, you have already begun establishing relationships or reacquainting yourself with some of the industry’s most prominent decision makers. As you have surely noticed, tonight’s audience is chocked full of our Member Lines’ CEOs, presidents and cruise executives, and one of them will be your table host! Of course, all of them are here to help you to forge or foster worthwhile business relationships with; learn about the inner-workings or latest trends of the industry; collaborate to cultivate ideas; or just get your foot in the door. However, the lines’ professionals are not the only people in attendance here to learn from and network with; everyone present tonight has some involvement in and knowledge of the cruise industry. All ends of the spectrum are represented tonight, and their wealth of expertise and experience is part of the reason why these events are so successful. We hope that you actualize this crucial potential, and we thank you for your participation in this event. It is through your input that our events become fruitful and productive, and this success goes directly to the FCCA Foundation, as all proceeds from this event will fund the FCCA Foundation’s efforts to support those in need throughout the Caribbean and Latin America. Of course, none of this would be possible without our generous sponsors—Port Everglades and PortMiami—and our utmost gratitude goes to them. Fortunately, their magnanimity has allowed for much more to look forward to. So please prepare yourself for a delightful evening full of festivities, networking opportunities and chances to learn about the industry and promote your product or destination. Stress? Stress? There’s There’s a cruise cruise for for that. that. Call Call in in at at Santo Santo Domingo, Domingo, Samaná Samaná or or La La Romana. Romana. DOMINICAN DOMINICAN REPUBLIC. REPUBLIC. CLOSER CLOSER THAN THAN YOU YOU THINK. THINK. A GREAT CRUISE STARTS WITH A GREAT PORT. OR FOUR. Head toward a cruise destination both you and your passengers will appreciate. The four ports of the U.S. Virgin Islands offer well-established cruise destinations with newly renovated and fully appointed facilities. Additionally, St. Croix offers highly efficient bunkering services. Plus, our white sand beaches, turquoise waters and picturesque towns offer all the island experiences your passengers are looking for. For more information on the ports of the U.S. Virgin Islands, visit www.viport.com and www.wico-vi.com. 800.372.USVI ÂŠ2012 United States Virgin Islands Department of Tourism. Lauderdale, Florida, has grown to become one of the busiest cruise ports in the world with 12 cruise lines, 45 cruise ships, more than 2,000 different cruises, and over 3.6 million passengers expected this year. Our goal is simple: to be the best at what we do. So we’re constantly investing in improvements to meet the growing needs of the cruise industry and their guests. We provide modern, spacious and comfortable cruise terminals, and a dedicated customer service staff to work directly with cruise lines. After all, cruise vacationers eagerly await their cruise, so we see it as our job to make sure that any time spent in Port Everglades only enhances that experience. The world’s top cruise lines have discovered the many advantages of homeporting at Port Everglades. • A deep harbor • Direct highway access • Multiple port entrances • In the heart of a popular tourist destination • Our proximity to Fort Lauderdale-Hollywood International Airport and its low-cost carriers We asked our cruise guests to “bring it on.” As a result, our guests now enjoy new easy-to-read directional signs, wider roadways, faster taxi and limo service, more on-site parking, an interactive website, a cell phone waiting area for those picking up returning cruise guests, and cruise terminals that are being updated with the latest conveniences. No wonder we’ve been recognized by major cruise magazines as one of the most convenient, friendly and efficient ports for discerning travelers. Just as exciting is the emergence of Greater Fort Lauderdale as a luxurious destination for pre- or post-cruise vacations. Cruise passengers sailing out of Port Everglades can now book a hotel room and plan their pre- and post-cruise vacation directly at www.porteverglades.net. and, since that time, Miami has continued to build upon its reputation as Cruise Capital of the World. We are proud to be the homeport to the world’s most distinguished lines - Azamara Club Cruises, Carnival Cruise Lines, Celebrity Cruises, Costa Cruises, Crystal Cruises, Disney Cruise Line, Norwegian Cruises, Oceania Cruises, MSC Cruises (arriving 2013), Regent Seven Seas Cruises, and Royal Caribbean International. PortMiami welcomed more than 4 million passengers last year, the fourth year in a row the Port topped the four million mark. No other port in the world matches this traffic. PortMiami is anticipating another exceptionally strong cruise season in 2012 as Miami will welcome two new cruise brands and three new build vessels. Of the four new build cruise ships entering the U.S. market in 2012, Miami will homeport three of them. Miami’s passenger facilities are first-class, from well-groomed outdoor landscaping to gleaming floors and lounges inside. Besides offering the best homeport anywhere, Miami-Dade County affords an ideal opportunity for our cruise passengers to extend their warm-weather vacations with land stays in the greater Miami area’s tropical tourist mecca, which offers a wide array of multicultural attractions, superb accommodations, world-class dining, endless shopping and fun-filled beaches, not to mention a great variety of cultural and sporting opportunities. PortMiami, set in one of the most beautiful locales in the world, has an unwavering commitment to the cruise industry. To continue its position as a world-class facility, PortMiami is continuously preparing for the next generation of cruise vessels. In the next few years, the Port is investing more than $30 million in renovations to enhance its cruise facilities keeping excellent customer service as a top priority. Also, on the drawing board are plans for the world’s largest multi-terminal facility which can potentially serve several cruise vessels simultaneously. A cruise starts the minute a passenger steps foot aboard a ship. However, at PortMiami…the vacation begins the minute you cross our bridge…the dramatic Miami skyline…our crystal waters and tropical island… and the glittering lights of South Beach. Cruising from Miami adds yet another enticing port to your itinerary. Cruising and Miami will always be synonymous. FCCA Foundation’s Holiday Gift Project Brings Gifts, Smiles and Holiday Cheer to Deserving Children In the Caribbean and Latin America, the holiday season is not heralded by a white cloud of fresh snowfall. While carolers begin to notice that “it’s beginning to look a lot like Christmas,” citizens and tourists are still basking in the sun and splashing in the seas. Since the climate is hardly inhabitable for reindeer, the FCCA, Member Lines and destinations have come together for the past 16 years to assist Santa in providing gifts to deserving, underprivileged children in the Caribbean and Latin America through the FCCA Foundation’s Holiday Gift Project. Last December again displayed the importance of this project, as over 6,500 children who would not have had any presents under their Christmas trees (or even a Christmas tree, for that matter) in 32 destinations throughout the Caribbean and Latin America were able to share in the yuletide festivities and joy because of this event put together by the FCCA Foundation, FCCA Member Lines and the efforts of many throughout the destinations and onboard the participating vessels. FCCA Holida happiness that she insisted that Santa accept her gift to him...a Jamaican fifty-dollar bill! It was a beautiful experience; the crew was right at home with the children as we sang and danced to a local mento band. Of course we had the stilt walkers entertaining as we all taught the crew how to dance Reggae! On behalf of the Ministry of Tourism and the Jamaica Tourist Board, I wish to express our gratitude for all your efforts over the years, and in particular with our newest addition in Falmouth.” This rapture experienced by the children is why all those who assist with this project are so impassioned and excited to do so every year. It is why Katherine Quiestas, group service coordinator access officer, Norwegian Dawn, Norwegian Cruise Line, tells, “It was an honor to be part of the event. My team was very thankful as well that they were able to experience this and it was really a heartwarming experience for each and every one of us.” Martha Rolle, Bahamas Ministry of Tourism, also displays this fervor for the project’s cause and effects and her willingness to assist: “We realize that the community looks forward to this gift giving. This is the most joyous time of the year, and giving and sharing is what kids look forward to, and we look forward to assisting to give that joy.” It would be difficult to not share the joy of the children as they received gifts while knowing that they would not have had this privilege without this project. It is too easy for some of us to take a “normal” Christmas for granted, but these children and participants truly enjoyed and appreciated every moment and will cherish their gifts and memories for time to come. This is exactly why the FCCA Foundation exists—to improve the lives of those less fortunate throughout the Caribbean and Latin America, primarily for children’s causes. Every smile is a reminder of this mandate and is more than worth the millions provided for causes and projects like these over the Foundation’s 18-year existence. Foundation History The FCCA Foundation is a charity that is dedicated to helping the people of the Caribbean and Latin America. The Foundation answers the needs presented by the destinations for the betterment of the people of these region. Participation in events such as the Holiday Gift Project, Food Programs, Caribbean Special Olympics, and Hurricane Relief Projects have helped improve the lives of the people in the destinations over the last 18 years, with the FCCA Foundation raising and donating millions of dollars. In 2011, the Holiday Gift Project brought an onslaught of joy and gifts to over 6,500 underprivileged children throughout 32 destinations. Events such as the FCCAâ&#x20AC;&#x2122;s annual online auction facilitates most of the funding for projects to take place through the monies gained. The FCCA online auction offered a variety of cruise and land-based vacations donated from our Member Lines, private and public sector partners. 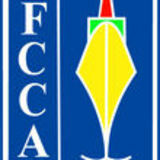 The FCCA Foundation is possible because of the dedication of all involved. We are all yearning for a common goal, and weâ&#x20AC;&#x2122;re coming continually closer. Cruise ship passengers will find the terminal is excep exceptional ptional at providing an EF F I C I ENT and S T RE RES S S -F REE embarkation process. HOUSTON – W WHERE HERE YOUR JOURNEY BEGINS.